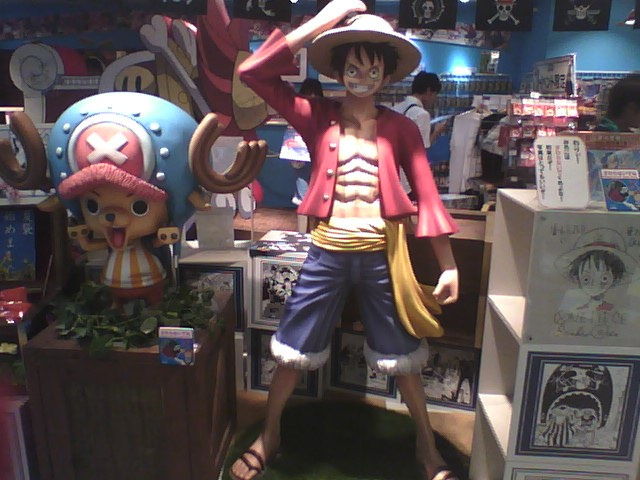 Do you know Japanese anime called ONE PIECE? As Japanese anime fan may already know, it is one of the most loved anime in Japan, and now it can even be read in other languages!! I wonder how many of you have actually read the book in your language?? (Let me know :-)) Anyway, here is an ONE PIECE related news from Japan! According to an article, ONE PIECE figurines will be available in Halloween costume this September. Most of figurines are Chopper or Kumashi, and they will be available at entertainment facilities only. So, it seems there are 3 types of figurines/ toys available from this Halloween collection; firstly, 4 types of figurines including Chopper and Kumashi will be on sale from the middle of September; secondly, approx. 55cm of large stuffed dolls also comes out at the same time; and lastly, ONE PIECE collectable figurines of the Straw Hat Pirates will be available from the end of September!! Now, how they look?? Good question! Well, I was tempted to explain each type of figurines available by words, but lucky me! I found a movie on youtube lol! Here are the ONE PIECE figurines offered as Halloween 2013 collections! There are quite a few of them, aren’t there?? I don’t know why, but Halloween items looks cute with some reasons, so I’d imagine these figurines must be appealing even to those people who are not particularly a big fan of ONE PIECE?? I don’t mind having the Chopper with big pumpkin on his head on my desk myself 😀 How about you? ?